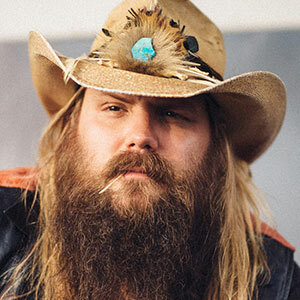 Grammy nominated singer, Chris Stapleton was born in Lexington, Kentucky, to Carol and Herbert Stapleton. He also has two older brothers and one younger sister and is 41 years old. He began his music career in the band Steeldrivers, and eventually made his way to the Jompson Brothers, but today he is a solo artist with hits like “What Are You Listening To?” and “Drink a Beer”. As a child, Chris’s hometown was Staffordsville, KY, but he eventually moved to Nashville to pursue a music career. Just four days after moving away from home, Chris found himself a record deal. Then, not so long after he moved, in 2015, the singer won Male Vocalist of the Year, Album of the Year, and New Artist of the Year at the CMA’s for his album Traveller, he is the first ever singer to have such accolades. On his album "Traveller", you can hear a mix between old country and modern rock. The tone of Chris’s voice is spectacular, along with the guitar riffs and piano melodies. One of the most popular singles from Traveller is “Tennessee Whiskey”, which is a remake from previous country artist David Allan Coe. Chris eventually performed this song with Justin Timberlake, at the Country Music Awards, the same year that he won all of the incredible awards. Another memorable performance by Chris, was when he appeared on the finale of season 12 of The Voice. Chris’s music was no stranger to the show, as contestants played his song “Tennessee Whiskey” in quite a few auditions. It was the first time that Chris appeared on the show himself, though. He blew the audience away with his performance. Before becoming a solo artist, Chris spent time in the bands Steeldrivers and Jompson Brothers. In 2008, Steeldrivers released two albums that scored Grammy nominations. Soon the band broke up, and Jompson Brothers who released an album in 2010, and toured with the Zac Brown Band, was formed. Chris never has to perform alone, because his wife is always with him. That’s right, she’s in his band. Who is Chris Stapleton’s wife? Well, she’s Morgane Stapleton, who performs backup vocals and harmonizes perfectly with Chris. The duo has been inseparable on stage and off, after meeting in 2003 while they worked as songwriters together. The couple married in 2007 and have been going strong ever since. The blessings keep adding up for Chris, because the singer and his wife welcomed twin boys in 2018. To respect his children’s privacy, Chris and his wife have never released their children’s names publically. Morgane gave birth to twin boys in April of 2018, and before that the couple had a boy and a girl, but we aren’t sure of the ages and there are very rare photos of Chris and Morgane’s kids anywhere on the internet. The couple wants to keep that information private, and we respect that wholeheartedly. The latest news is that the lovebirds are now expecting their fifth child, just seven months after their sons were born!